On this, the final day of 2018, I wish you a safe and healthy New Year’s Eve celebration and a prosperous New Year in 2018. The quote by President Ronald Reagan in 1983 is one which comes to mind for the year just past, and the year coming upon us. Our historic victories of 2018, in the face of a Blue Democrat wave which swept throughout Long Island, had their foundation in our Party’s ability to return our shared Republican principles to the Halls of Congress, the State Assembly, and the Judiciary. 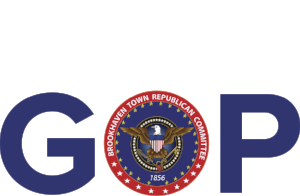 On behalf of your Brookhaven Town Republican Party and my Family, I wish you and yours a wonderful and safe New Year's celebration. This New Year's holiday, please be sure to rejoice; have fun; be safe; celebrate, and please offer a prayer for the brave men and women of our Armed Forces who are away from their own families in faraway lands this New Year’s holiday.